Edward Tricomi, of Warren-Tricomi Salons backstage at the Chadwick Bell show at Mercedes Benz-Fashion Week. Edward Tricomi is an esteemed celebrity hairstylist that has worked with clients from all over the world. He is the co-owner of Warren-Tricomi hair salon which is located in New York, Connecticut, New Jersey, Florida and California! His influence on hair system reaches all spectrums. 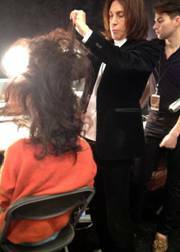 Seeing him work backstage at the Chadwick Bell Fashion Show during New York Fashion Week this season was very inspiring. He is a hands on hair stylist with a vision that cannot be beat. After asking him a couple of questions, I got insight as to how fabulous this man’s work is. What is the technique being used in this particular collection? It’s a basic set, teased a lot, hairspray, and at the end you mess it up…like she got caught in the wind or something. To get the look, Edward suggested using a curling iron or basic set of curlers, hairspray, and tease each individual piece, push it back and take a rubber band. Then put that rubber band at the very bottom, roll the hair up and pin it. That is how you get the short but still very big look. Some other ways Edward described his look for the model’s hair were sexhead, bed head, messed up, cool and chic. After speaking to the artists working on makeup and nails, I got the feel of what the inspiration was. The color of the nails were made by a mix of two nail polishes and gave the look of dry blood. The inspiration of the makeup was from Picasso paintings. They wanted to create a mysterious vibe. In your opinion who is the biggest icon and trendsetter for hair and beauty? Madonna, Lady Gaga, Halle Berry and Scarlett Johansson. Many people don’t know this but Edward is also a musician and has a love for music. If you had to choose one love: hair/beauty or music what would it be? I was able to choreograph and write music for different shows that I’ve done and teach people how to dance on stage. I’ve been fortunate enough to have done architecture and set design. All of those things; make clothes. All the clothes I am wearing are all clothes that are made for me. I don’t buy my clothes I design my own clothes. This industry has allowed him to do so many different things. It seems like hair and beauty has launched Edward not only as a hairstylist but as a brand in his own name. He truly is a jack of all trades.